Can Entrepreneurs Get Away with Sleeping Less? – Kathy J. Marshack, Ph.D.
Can Entrepreneurs Get Away with Sleeping Less? As an entrepreneur, you likely pride yourself on your resilience and tenacity. You push yourself beyond your limits, often sacrificing physical needs for the benefit of your business. Perhaps one of the first things to go after starting your business was a good night’s sleep. How much sleep do you get at night? Eight? Six? Less? 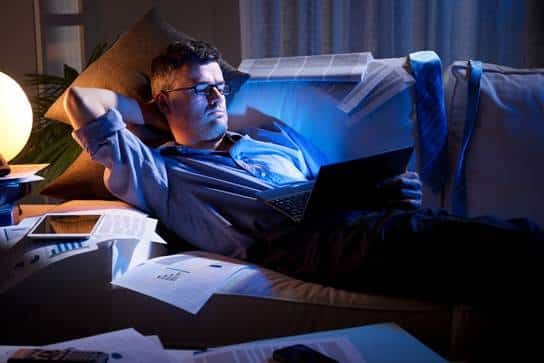 Do you find yourself staying up late and waking up early to care for all of your personal and business commitments? Being sleep deprived has almost become a status symbol in our culture. You must be very important, very in-demand, if you don’t sleep much. It is also viewed as evidence of a strong work ethic. Especially among entrepreneurs, a good night’s sleep is often looked down on, as something only lazy people get to enjoy. The reality is while you need to work hard and even make sacrifices to build your business, sleep should not be one of them! If you want to grow a successful business, a consistent lack of sleep isn’t going to help your cause. What about the people we hear about who thrive on five hours a night? That’s great for them. But know that they are a tiny group, making up only three to five percent of the population. Most likely you are not part of this group. Sleep experts tell us that the majority of healthy adults need between seven and nine hours of sleep every night. That applies to even the busiest entrepreneur! But you may think, “I haven’t slept more than five hours a night for months, even years. And I’m doing just fine.” Is that really enough for your body, though? Try this: the next time you go on vacation, track your sleep. How long do you sleep at night? Do you wake up feeling more refreshed and alert? As the day progresses, do you feel sharper, more even-tempered, and attentive? If you notice that you feel consistently more alert and even-tempered after a solid seven to nine hours of sleep, then take that to heart. You’re an entrepreneur, not a superhero. Good sleep, and enough of it, is non-negotiable! Your body and mind are not “fine” when you skimp on sleep. You may learn to survive on less sleep, but you can’t train yourself to thrive on less sleep. However much sleep you need is fixed, and you need to make the effort to get it. Why is sleep so important? Your body rejuvenates overnight. Your cells, muscles, and organs all perform vital, life-sustaining tasks when you sleep, keeping you healthy. Lack of sleep is linked to everything from depression to heart disease to cancer. Lack of sleep also affects your memory, impulse control, and stress management. It makes you less efficient at running your business. Sleep deprivation impairs your ability to make good decisions, follow through, and communicate effectively. The qualities that led you to entrepreneurial success – innovation and adaptability – are quick to decline. So if you are not getting enough sleep, take action now. Reschedule your routine to leave enough time for sleep. Do you need eight hours to feel good and perform at your best? Then plan accordingly. Take charge of your physical and mental health by getting the right amount of sleep for you! Sleep problems can be deeper than simply not having enough time to sleep. If insomnia has become a problem for you, please consult with your physician. If he or she can’t find a solution to your chronic insomnia, and you live in the Portland, OR/Vancouver, WA area, please contact my office to set up an appointment. I can help you get back on the road to optimal health and wellness.